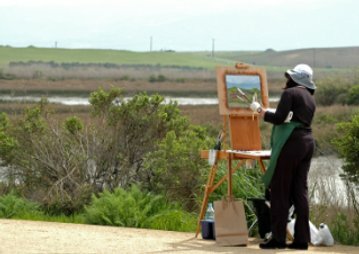 If you love to paint and you love getting outdoors, then plein air painting is for you. There's nothing quite like painting from life, on location...no photograph can completely substitute for it. Painting outdoors has its own challenges, however, so you should give some thought to what you bring before leaving the studio. You do not want to get everything into position and then think, “Oh no! I forgot to bring...” Especially if you are painting a long way from home. If you do plein air painting on a regular basis, then over time you will develop a set of practices and supplies that works for you. To get you started, here is a list of basic equipment. Obviously, when you are going out to paint, you want to be mindful of the weather, but there's more to it than that. The bright light outdoors can reflect off your clothing and make it more difficult to see and compare colors on your canvas. Therefore, you should wear neutral colored clothes and avoid white and really bright colors. I always wear a hat to control the glare when I paint outdoors. Use sunblock or wear long sleeve shirts to avoid getting sunburned. If you are painting in a bug infested area, then insect repellent is essential. Imagine the fun of chasing away flies or mosquitoes while you try to concentrate on painting. Not for the rain...The sun glaring on your painting and into your eyes can be a big distraction. In general, it is better to paint in the shade rather than having your canvas in direct sunlight. You can buy umbrellas with clamps which attach to your easel with clamps which attach to your easel. Others are available with long, collapsible, spiked poles for insertion into the ground. The preferred color for this sort of umbrella is gray. You can paint it if it was not gray to begin with. A neutral color prevents it from casting a colored glow on your painting. Use a viewfinder to help you isolate a desired scene for painting. It is an essential piece of tool for painting outdoors because the landscape can be so overwhelming, with so many details, and such open views that it can be hard to narrow things down to something you can put on a canvas. The sketch pads are handy for small sketches and written notes. 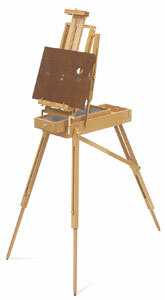 There are an array of easels available for plein air painting. 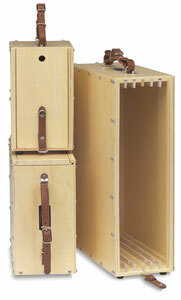 The two major categories are French easels and pochade boxes. You also find one type that will work with your photography tripod. The one you choose is a matter of personal preference. I have owned both full size and half size French easels. Then I tried my tripod. Now I use the pochade box exclusively. I love the fact that it is extremely portable and light weight compared with other types of easels. I have gone out more and travel lighter since I own one this year. Match the base color of your canvas to your palette. If you paint on white canvases, use a white palette. If you paint on a toned canvas, your palette should be a mid-toned neutral color. This way, you can be sure your color mixtures will be accurate. I use only three colors, plus white, when I paint outdoors. This reduces the weight of my equipment and simplifies the color palette. Only use colors you know well for your first plein air painting experiences. Often brushes with flat ends are the norm for painting landscapes outdoors. I have found rounds very effective for plein air painting also. They are versatile and can be manipulated to create many interesting effects. I also use filberts a lot when I'm just starting a painting. I use smaller filberts to put the finishing touches on. I recommend bristle brushes for plein air work, because working outdoors lends itself to the painterly look. Bring a selection of brushes from size four to twelve, but don't go overboard...remember that you have to carry whatever you bring. Make sure you bring smaller sized canvasse to work with. If the canvas is too large, you will not be able to finish the painting. Normally one to two hours a session is plenty so you should have some idea what size of canvas you are comfortable with. Remember that the light is always changing outdoors, so you have to be able to capture the scene fairly quickly before the light changes too much. I prefer to work no more than two paintings in any given plein air session. When you finish painting, you will need to carry it back to your studio without getting your fingers, and everything else, dirty. 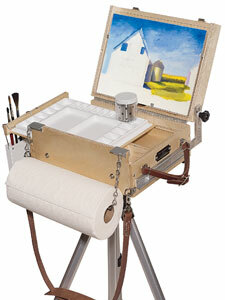 A wet canvas carrier is a must for plein air painters; these are boxes with slots to hold stretched canvases or panels apart while the paint is wet. A camera is another essential tool that will help you catch the fleeting weather conditions and record colors and details to guide you as you put the final touches on your painting back in the studio. Take many photos of the same scene from different angles. I usually carry my digital camera, but you also can bring a film camera. If you have a slide projector, you can use slide film for maximum color and resolution. Looking at the reversed image of your painting in a mirror enables you to see it with a fresh and unbiased eye. It really helps you catch problems quickly. 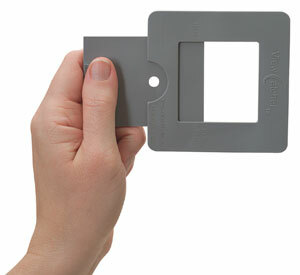 Make sure the mirror is small enough so you can easily carry it with your plein air equipment. I hope you feel more ready to get out to learn from nature. Remember, this list is just to get you started; with experience you will be able to add to, or modify your plein air equipment to suit your particular way of working. Relieve the experience of the French impressionists and happy painting!